When planning a wedding, most of the ring attention is given to the woman. It is about her engagement ring, then her wedding ring, and everyone focuses on her pretty ring set. 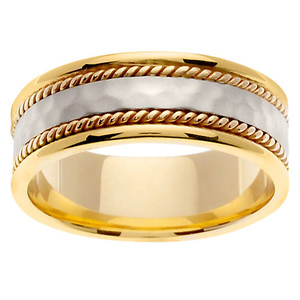 But men's needs should not be overlooked - they deserve some attention paid to their mens wedding bands as well. Choosing wedding bands for men require a few pieces of information. What does he like and what is he willing to wear? Whether the woman is shopping for her man or he is shopping for himself, it is important to know his tolerance for the wedding ring. Not all men will want something bold. By the same token, some men really like a wide and dramatic mens unique wedding bands. At JewelryVortex, we noticed that both the brides and/or grooms buy mens wedding bands, so we broke down theses tips to both shoppers, Women Shoppers and Male Shoppers. What does your ring set look like? Do you want the sets to coordinate or match? Does your fiance wear other jewelry, or will this be the only piece of jewelry (except for a watch) that he will wear? Does he like gold? What about platinum? Does his jewelry have gemstones, or do they have a simple style? Is he allergic to gold? If so, you may want to choose platinum, palladium, tungsten, or titanium rings. Once you have some basic questions answered, you need to consider the size and style of the wedding band. Many men like to wear a basic gold band, but these days there are so many options for men's wedding bands, it is worth some time to consider the options. 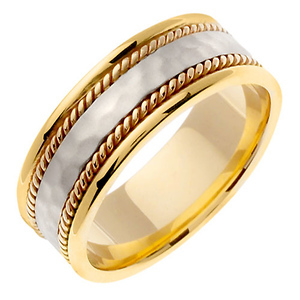 Hand-Braided Mens Wedding Bands can be made from silver, gold or platinum; they sometimes have more than one metal mixed into them. These bands are ideal for the man who wants something more than a basic gold or platinum band but who does not want anything fancy or very bold. Contemporary Mens Wedding Rings are sleek and modern, ideal for the man who is always a step ahead in his fashion sense. Christian Mens Wedding Bands are ideal for the man who wants to share both his love for his wife and his love for God at one time. Diamond Mens Wedding Rings are nice for the man who wants a basic wedding band with a touch of added elegance. What feels good on your finger? Give your friends a laugh by asking them if you can try on their wedding rings. Try on a variety of rings. Do you like something that is very simple like a plain platinum or gold wedding band, or do you like rings that have more artistic or unique designs to them? Where do you work? What activities do you do? Depending on your lifestyle, you may want to choose a highly sturdy, scratch-resistant metal, such as tungsten (most scratch resistant) and titanium. Are you allergic to gold? If so, you may want to choose platinum, palladium, tungsten, or titanium rings. What does your fiancee's rings look like? While it is not necessary for you to match your fiancee's ring, you should think about the overall design of her wedding set and consider if the rings are similar. For example, she might not like it if she has a platinum set and your ring is gold. You might want to ask her if she has a preference there before you go shopping. In many ways, shopping for his ring will be easier than shopping for hers, but considering some basics of what he likes and what he will tolerate is essential to getting the job done just right.